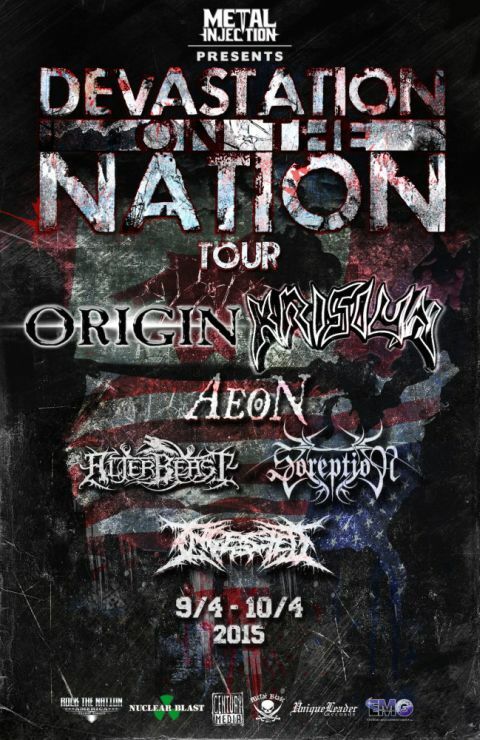 It’s the “Devastation On The Nation” Tour with Origin, Krisiun, Aeon, Alterbeast, Soreption and Ingested. This is going to be sick. I’ve been musing aloud about the number of incredibly crushing Metal tours that were happening and just the other day the folks at Metal Injection revealed their full lineup for a tour that they have put together called “Devastation On The Nation” for 2015. It places a co-headlining Origin with Brazilian brutality purveyors Krisiun and you can check out the poster below. From top to bottom the lineup for this touring package will be Origin, Krisiun, Aeon, Alterbeast, Soreption and Ingested. At the point of this writing no venues nor the amount of stops happening have been set up. I’ll share that stuff when I see it posted as well for good measure. I wanted to make sure that this information was conveyed to my always awesome readers in case they are dealing with younger siblings who are insane over the departure of Zayn Melik from One Direction. Take this action as a queue to educate said siblings into the Metal ways. See you next time but before you go let’s discuss what you think about this package and where you would like to see it happen in terms of venue in the comments section. They are known as one of the “Three Kings Of Teutonic Thrash” and their name is Destruction. Sonically they are a no holds barred assault on the fabric of Heavy Metal music and its been a couple of years since we found them paying our region a visit. Tonight that would end with the band locking in a gig at the still kind of new Marlin Room space in NYC’s Webster Hall. For those who are still curious about this one, its the space on the middle level of the Webster Hall building and it holds about 500 people depending on the setup. Destruction would be bringing along both Krisiun and Widow as their national acts and start the fans off with some talented local support. Click the logo to be brought to the full concert article and the photo galleries. Then do return to this space to enjoy some images from the show that can only be seen here since they are rather exclusive to PiercingMetal’s Blog. It’s been a couple of years since the mighty Destruction has been to NYC and if you followed the bands social mediums during that last run you will know full well how that visit was not a good experience for the band. Their founder Schmier publicly lashed out about the bad promoters and venue treatment and in some cases even the fans but that was then and this is now because Destruction was coming back and bringing along the intensity of Krisiun and Widow as their lead off national act. Some dates would feature Exmortus but our Metropolis would find Widow on the bill and I was fine with that as I had wanted to see them for a couple of years now but never got the chance. March Metal Madness was going to be kicked up a notch for sure. Here is how it went down for those who did not attend. The show was held at The Marlin Room at Webster Hall which is a reasonably new space in the massive building and one that holds a couple of hundred more than the downstairs space known as The Studio at Webster Hall. I like its overall spaciousness and there is more room to find a circle pit happening so be aware of that should you be attending a show there. Tonight’s fun would start early and feature two local acts by way of Metalfier and Winter Nights. I’ve seen both bands before and like their spirit for the game and suggest you check them out if the time is there to do so. I walked in when Winter Nights was closing out their set after a fun pregaming time at The 13th Step which is a favorite watering hole for me when hitting this particular venue. Widow hit the stage at 8:30 and this is where I pick up the larger part of my coverage.